Mobile marketplace Zaarly launched a tool Tuesday that allows publishers to connect local businesses with consumers looking for goods and services. The application programming interface (API) code for Zaarly Anywhere places a button on the publisher's site that connects the reader to local marketplace. The Los Angeles Times and The Fancy will launch Zaarly Anywhere within 30 days. Everyday Health, Cookstr, IKEA Hackers, Remodelaholic and Simplified Building recently implemented the tool. Zaarly's button on a publisher's site sends a message to "hundreds of thousands of small business owners and professionals" who can fill requests in real time, according to Zaarly cofounder Eric Koester. That's about 40,000 businesses. The API adds a button to the publisher's page near editorial content, or creates an overlay on the photo when someone scrolls over an image. Information includes title, description and location details from the publisher's site. The tool searches for local experts. Participating publishers earn a percentage of each transaction tacked back from the API. The next set of improvements will focus on tools for sellers, such as video. Since launching the site in May 2011, more than $30 million in requests have been posted on Zaarly's marketplace. 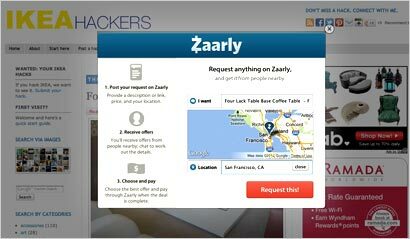 Zaarly got its start in 2011 after being built at Startup Weekend in Los Angeles, a sort of hackathon. An early beta launched at South by Southwest. Ashton Kutcher initially funded the local marketplace, which raised a total of $15 million through venture capitals and seed investors.